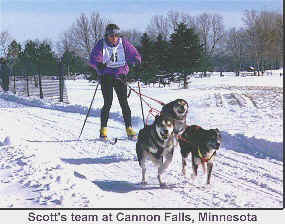 Scott Dahlquist, one of the top competitive skijorers in the Midwest Region of the Lower 48 States (USA), was kind enough to provide the following articles to Sled Dog Central. In a world where cross country skiers and dogs rarely mix, what is the sport that combines Nordic skiing, canine athleticism, and mushing skills? The discipline that is the fastest growing segment of sled dog sports? The racing class that allows small kennels and large kennels to compete on equal footing? The sport that can take the family dog out of the living room and onto the snow? Answer: Skijoring, a blend of cross country (Nordic) skiing and mushing, where skier and animal work together to give you the ride of your life. Skijoring is simply connecting the skier and dog or dogs in harness together via a specially designed belt and tugline. A harness that allows the dog to pull comfortably and safely completes the package. Skijor packages are available through many mushing outfitters--check the supplier links on this web site. The ability levels of both skier and dog can be remedial. A dog of 35 plus pounds can easily pull a skier down the trail for an afternoon of fun. As with all new endeavors, some training for both skier and dog can go a long way. The average family pet may require some short outings that will allow it to build stamina and learn to accept commands that will keep you both on the trail. For the skier basic skills are required--a skier should be competent enough so falling and stopping do not frustrate both skier and dog. 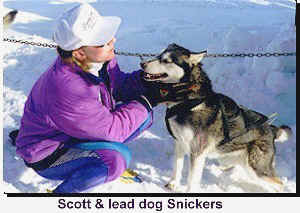 Regular books on mushing or an excellent book, Skijor With Your Dog, can help. Instruction for you and your canine is available, and a trip to one of the local competitions in your area can be a great resource. If possible, hook up with another skijorer and allow your dog or dogs to follow behind, learning from other dogs what is required. If possible, hooking a more experienced dog in with your novice dog can accelerate the learning curve. Dont be frustrated--the process of learning can be wonderful for both dog and dog driver. Learn from others--skijorerss and mushers are a great resource and they are willing to help. Dogs and skis are a natural. The satisfaction of working together brings you both closer than just about anything else. Athletic dogs are healthier and live longer and the mushing community is one of the most encouraging and supportive there is. If you have skis and a dog, you're almost there. Its just a few more steps to the greatest winter pastime since the snowball fight! Maybe the fastest growing segment within the sport of mushing is skijoring. This discipline that combines Nordic skiing and dog driving has caught many would be mushers' imaginations. Those seeing a team on the trail for the first time seem to instinctively believe that it something that they can do, and do with the family pet. At a certain level this may be true, however, it's important to know the difference in the physical condition of a well-trained team and the physical condition of "Bowser" the family house dog. So before hookup for that afternoon tour, and long before race day, a program of conditioning for your dog or dogs is essential. The key to preventing injury or early season burnout is to start slowly and make it fun. Two things need to be addressed in a training program: one is the body and the other is the head. If one or the other is injured the end result is the same. The body's strength and endurance will give the dog the ability to work, but the mental state will allow its body to utilize those physical assets. In regard to the head, everyone has heard of the athlete that plays beyond physical ability. This is an example of the head taking over where the body left off. The converse is where a negative mind set negates all the physical ability. These same things are true with our canine athletes, but even more so. Dogs interpret the messages we send during training in relation to their world and take things at face value. Its as if we told an annoying child to "get lost" and they went out and did just that. It is imperative at the start of training that the musher think not only about what we want to teach our animal, but how our animal will interpret what we teach it. Lessons should be structured to eliminate any chance of failure. Success will encourage a willingness to learn more. Training should be positive, encouraging whats right not punishing whats wrong. This will go a long way in accelerating the learning curve. Training for strength and endurance is as varied as the number of mushers there are in this world. No two people will agree all the time as to distance, frequency, intensity, etc. It is beyond the scope of this article to discuss specific training techniques. It is more important to convey some basic guidelines as to what mushers should and should not do when beginning to train their skijor teams. Once again, I cannot stress enough the importance of your team's attitude. Without their willingness to participate you will never get them beyond the end of the driveway, let alone on the trail. Start slowly and gradually increase time and distance. As an early season exercise its great to take an individual dog in harness, hooked into your skijor belt and tug, and go for a little run. Using the skijor belt and bungee tug takes a lot of the strain off you and the dog. Stop frequently and praise your animal. Work with "gee" (turn right) and "haw" (turn left) commands, using well-defined trails that only go in the direction you wish the dog to go. Call out the appropriate command and when your dog goes in that direction, praise them profusely for a short period of time and then shut up. (Continually talking to your dogs will cause animals to tune you out.) Use these sessions to spend time reacquainting yourself and your dog with what its like to be hooked together. Keep in mind that both of you will probably be sore tomorrow, so dont work either of you too hard. As the weather cools and it becomes time to increase the mileage and intensity of your workouts, a wheeled rig will be a great help. Many skijorers use bikes to work their dogs. With one or two animals they have found it to be an inexpensive alternative to four wheelers or carts. It is, however, rough on a bike and the constant need to apply brakes causes great wear. Carts designed for training small teams work wonderfully and are heavier so the dogs work harder and control is easier to maintain with multiple animals. Whatever you use, remember that sore muscles come with the increased load and the weather can still be too warm for heavy exertion. Keep in mind not only the temperature but the humidity. High humidity saps strength and overheats the dogs more quickly. These early wheeled runs are great for building muscle and increasing endurance, however, keep speeds slow. Allowing an over anxious team to race down the trail during the first few runs of the year is an invitation to injury. Selecting a good training trail can go a long way to preventing injury during dirt training. Forest trails with soft footing are wonderful when available. Dirt roads are also good but hard pack can cause injury to joints. Blacktop and cement walkways are very hard and abrasive--if you must use them, keep your runs short and slow. Even worse, if the blacktop is in direct sunlight, the surface can be hot enough to burn pads. Common sense and patience go a long way toward making these early runs injury free. By the time the first snow flies the dogs should have a pretty good base of training miles. Or at the very least the mass confusion, characteristic of early runs, should be behind you. The dogs and you should have a routine down. Unloading, harnessing, and snubbing off should be routine. Doing things in a set order and going through a mental checklist usually help to avoid forgetting things or making a mistake that could cause problems. These first runs on snow, however, have their own set of problems. Shallow snow cover can make slowing or stopping difficult or impossible; ice can be a hazard; bare patches of trail can stop a skier cold. The key is to stay in control and watch the trail ahead. A field of vision that only includes the tips of your skis to the nose of your lead dog is much too limiting. If you encounter tough sections of trail, have a plan--note the best line for your skis, where the ice or soft snow is, or the best area for a run out if you have to leave the trail. Always carry a line with so you can snub a team off to a tree (you are not carrying a snow hook) and always carry a knife. I hook one to a lanyard around my neck because there are never any pockets in those lycra tights. Control is very important during the first snow runs, slowing and stopping is more difficult and it is of utmost importance to never run into the back of your team. A dog that is been hit from behind by a skier or sled remembers it for a long time and may never feel comfortable running in front of you again. First, the intensity of workouts should be varied. A race paced workout should be followed by a slower fun run. A distance run can be followed by one that is shorter and faster. Training areas should be varied. Dogs will tire of the same trail and they will come to know and anticipate turns and hills. If you must run the same trail, change it around. Run it backwards, start in the middle, or stop and reverse yourself. If you have to use an out and back trail, make your reverse in different places--drive past the place you normally turn around. Dogs will begin to anticipate the turn and the first time they "come gee" without your permission, its time to change the route. Second, rest is as important as the miles you put on. Dogs will tire of running. Allow them a few days off if you think the enthusiasm is waning. It will do them some good. Spend some time just being with them petting, brushing, or talking. It can go a long way toward improving attitude. Third, watch for injuries. A change in attitude, appetite, or gait, can be an indicator. Check joints for range of motion or swelling. Rest them or see a veterinarian as needed. Last but not least; maintain a high quality diet. Dogs will need more calories when training and when the weather turns cold. Increase the amount of feed and increase the fat content. Making sure that your animals are adequately hydrated is just as important. Soaking food and baiting water are two important ways to achieve this goal. It might be an evening tour through the darkening woods, a two day sprint race, or a few days camping in the Boundary Waters. Whatever your aspirations are its important to prepare yourself and your dogs. These animals that work so hard for us will do so only if we help them prepare for the task at hand.